The revised budget is nearly four times the £2.4bn estimate when London's bid succeeded less than two years ago. Construction is now budgeted at £5.3bn, there is a £2.7bn "contingency fund", and tax and security costs have risen. The Tories attacked her decision to "raid" an extra £675m of lottery funds - which means £1 in every £5 of good cause money now going to the Olympics. The budget outlined by Ms Jowell on Thursday largely covers construction costs of the Olympic Park and venues. 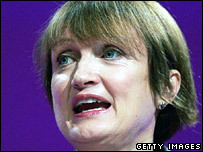 The contingency fund will ensure the government cannot be "held to ransom" as it aims to hit deadlines, Ms Jowell said. The government's contribution has risen to £6bn, she said, with £2.2bn coming from the National Lottery - including the additional £675m - and the rest from London's council tax payers. London Mayor Ken Livingstone has pledged to contribute an extra £300m, she said - but the money would not be funded from London's council tax, nor higher transport fares. The cost of staging the event itself - currently estimated at £2bn - will be met through selling television rights, corporate sponsorship and ticket sales. The Department for Culture, Media and Sport later said the £2.4bn estimate from two years ago did not include costs for such items as regeneration and infrastructure - which the £9.3bn now does. Responding to criticism of the decision to use more Lottery money, Ms Jowell said that in the "overall scheme of things" its contribution was relatively small. She said the Lottery would benefit from profit sharing based on rises in land values in the Olympic park area. "London 2012 will bring huge financial gain to the whole country ... and it is only fair that the Lottery good causes should share in any such windfall," she told MPs. Winning the Olympics had brought an extra £7bn of private sector investment to one of the most deprived areas in Europe, Ms Jowell said. "The announcement today means it's full steam ahead for 2012," she added. But for the Conservatives, the shadow Olympics minister Hugh Robertson said: "If you add together all the separate parts, the budget for which the government is responsible has nearly trebled since the Olympic Bill left Parliament under a year ago. "In raiding the Lottery for a further £675m to make up the shortfall the government will penalise precisely the clubs and small organisations, up and down the country, that were supposed to benefit from the Olympics." Scottish Nationalist Party MP Pete Wishart accused the government of using the National Lottery as "their own personal piggy bank" and said Scottish causes would suffer, to pay for London's regeneration. But Big Lottery Fund chairman Sir Clive Booth told the BBC he thought it could have been worse. "When I go back to the beginning of February and the numbers we were looking at in terms of increasing costs and what that could have meant in terms of impact on us, this outcome is much, much better," he said. Tory MP Mark Field suggested that the original budget was "a lot more slack than it might otherwise have been", because Ms Jowell had not expected London to win the bid. She, in turn, accused the Conservatives of trying to undermine the Olympics and said they would have preferred it if London's bid had failed. Liberal Democrat MP Don Foster said: "Properly managed, the 2012 Games will bring huge and lasting benefits to all parts of the country. "But sadly today's statement and the chaos that has surrounded the last 12 months and more, calls into question the government's ability to provide that proper management." Of the £5.3bn budget for the Olympic Delivery Authority announced on Thursday, £3.1bn will be allocated to build the Olympic Park and venues and £1.7bn for regeneration and infrastructure. The ODA would also be given a £500m contingency allowance - but the rest of the overall £2.7bn contingency fund would be "locked away", Ms Jowell said. Another £600m had been allocated for "wider security" outside the site, and £390m for other costs including the Paralympics and community sports coaches.